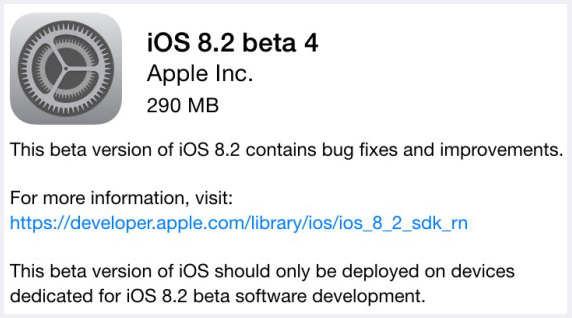 Apple has officially seeded and released the fourth beta version of iOS 8.2 Firmware i.e. iOS 8.2 Beta 4 (Build: 12D5461b) for iPad, iPhone, iPod Touch and Apple TV devices to iOS developers and non-developers (general users) for testing and experimenting of various features and functions. The Direct Download Links of iOS 8.2 Beta 4 IPSW Firmware for iPad Air 2 6G, iPad Air 5G, iPad 4G, iPad Mini, iPad Mini 2, iPad Mini 3, iPad 3G, iPad 2G, iPhone 6 Plus, iPhone 6, iPhone 5S, iPhone 5C, iPhone 5, iPhone 4S, iPod Touch 5G and Apple TV 3G are posted below for our exclusive readers and followers. It's still unknown, when iOS 8.2 Final Firmware Version will be released to the general public, but Apple has already started an early tests of iOS 9 prototype builds, and also recently seeded an iOS 8.1.3 Beta 2 (Build: 12B466) to its retail employees, which is expected to be released in coming weeks. The release notes and changelog of iOS 8.2 Beta 4 Firmware (Build: 12D5461b) contains; fixes of bugs, improvement in performance, addition of new features and functionalities, support of WatchKit SDK for Apple Watch apps development etc. Click Here to read more about iOS 8.2 Beta 4 Update. How to Manually Install iOS 8.2 Beta 4? 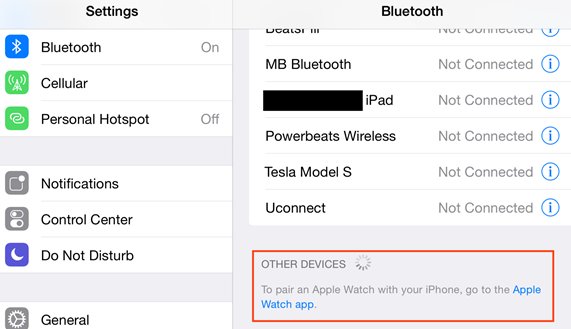 To upgrade / update / install the latest iOS 8.2 Beta 4 (12D5461b) via OTA (Over-the-Air) wirelessly, you can simply head-over to Settings > General > Software Update option. If you're an iOS developer, then go to iOS Dev Center website for iOS 8.2 Beta 4 Downloads. If you're an iOS non-developer (general public user), then install and activate iOS 8.2 Beta 4 without iOS developer account and Apple UDID via iTunes for Free. Download iOS 8.2 Beta 4 IPSW Firmware for iPhone 6 Plus, iPhone 6, iPhone 5S, iPhone 5C, iPhone 5, iPhone 4S, iPod Touch 5G, iPad Air 2 6G, iPad Air 5G, iPad 4G, iPad Mini, iPad Mini 2, iPad Mini 3, iPad 3G, iPad 2G and Apple TV 3G via Direct Links below. How to Jailbreak iOS 8.2 Beta 4? You can Untethered Jailbreak iOS 8.2 Beta 4 Using Taig Jailbreak Tool for iPhone, iPad and iPod Touch. Follow our Guide and Tutorial HERE.